Unfathomable G is the one entity whose power is said to be above that of the Original Slam Gods, theoretically making them the most powerful being in the universe. Despite the import this implies, Unfathomable G is rarely mentioned in the Book of Slams (see Waltz no. 1, pages 56-58. and Waltz no. 16. pages 1,452-1455), and is so rarely acknowledged by the Grandgod Church that they have been turned into something of an apocryphal footnote. Unfathomable G has found a place within the cosmological frameworks of fringe religions based upon Slam. Most believers agree that Unfathomable G possesses a Power of Slam so great that "Slam" must be written as "SSSLAM" in religious texts. A unique musical style has sprung from these denominations which has bass singers intoning "G" in G minor for up to a half hour straight. 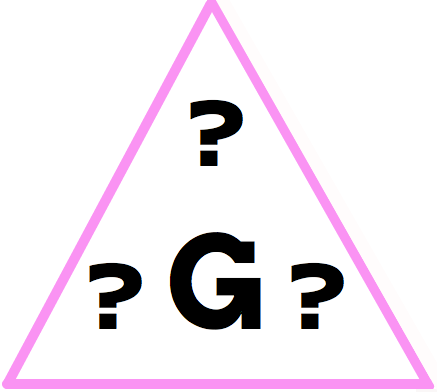 The only imagery associated with Unfathomable G is a symbol, wherein the letter G is surrounded by a pyramidal arrangement of question marks. All other imagery is considered taboo, for it will surely fall short of the greatness and glory of Unfathomable G.